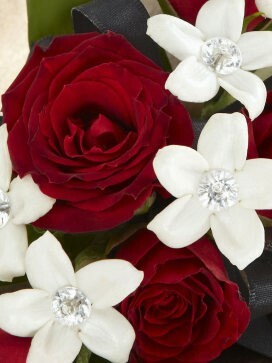 A classic and traditional love and purity corsage. This love and purity corsage is an eye-catching array of bold, rich reds classically complimented and contrasted with the crisp, innocent, pure whites. 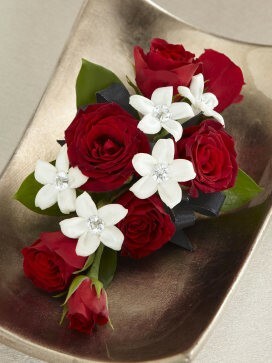 This stunning corsage is indeed the perfect accessory fit for any special occasion, most popular amoung weddings. 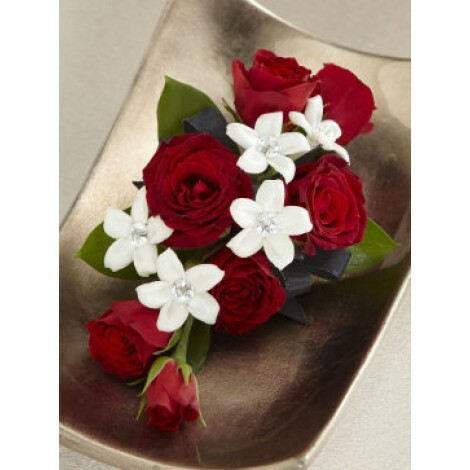 The love and purity corsage is comprised of; red spray roses are creatively enhanced and accented with white stephanotis blooms complete with sparkle pins set in the center - creating a glistening, eye-catching floral accessory to be envied!